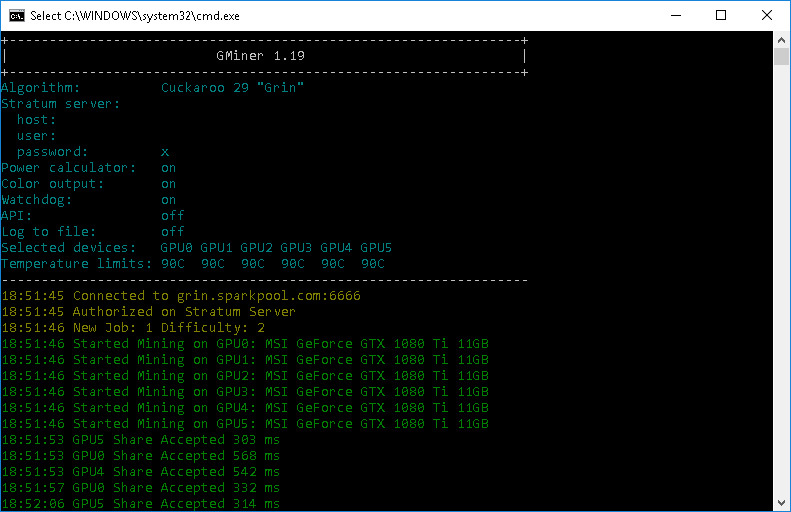 GMiner has just added support for the new Cuckaroo29 algorithm being used by Grin with the latest update to version 1.19. This marks the first non-Equihash algorithm getting support in the miner and maybe it will also open the doors for other algorithms to get implemented in the future. Performance wise it may not be the fastest Grin miner out there, but it does seem to work quite well based on our short experience with the new version for now, so you might want to give it a try. Due t the higher video memory requirements of the Cuckaroo29 algorithm you will need to have an Nvidia GPU with 8GB VRAM (about 7GB are currently required) as well as enough virtual memory available. Apart from Cuckaroo29 GMiner also supports Equihash 96,5, Equihash 144,5, Equihash 150,5, Equihash 192,7 and Equihash 210,9. The miner requires an Nvidia GPU with CUDA compute capability 5.0 or later as well as CUDA 9.0 driver support. Do note that GMiner is a closed source miner for Nvidia GPUs with binaries available for both Windows and Linux, also there is a 2% developer fee built-in the software.